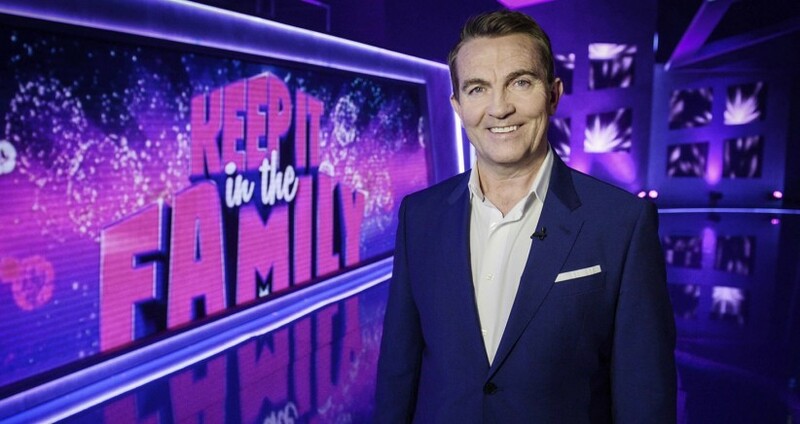 Bradley Walsh hosts a brand new series of the popular family gameshow, Keep It In The Family. Thousands of families applied to take part in the seven part series, which features new rounds, some death-defying acts, and a showcase for some of the most talented kids in Britain. Two families compete to win a selection of incredible prizes ranging from a brand new car or an exotic family holiday….to a year’s supply of sprouts! As always, it’s the kids who are in control. But of course, some of the old favourites are back…with a bang. The beloved Nanas, with a few new additions to the team, return to give their hilarious take on modern day phrases and topics. And the dreaded trap-floor is back to haunt our host of celebrities. Facing the drop last year were the cast of Coronation Street and Emmerdale, supergroup McBusted, popular X Factor contestants and jungle survivors from I’m a Celebrity…Get Me Out of Here, all attempting to help the families solve a series of cryptic clues and pleading not to be dropped. This time round, once you’ve been dropped, there’s no coming back! 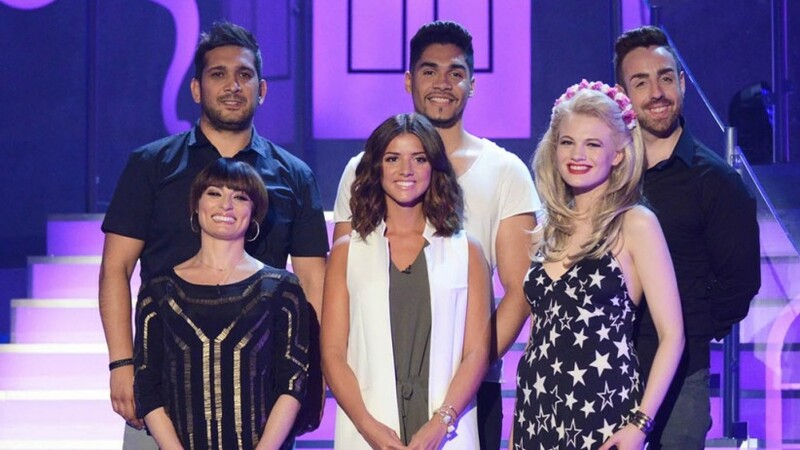 In the first episode of the new series to be broadcast on Saturday 8th August at 7pm on ITV, famous celebrity couples including, former X Factor contestants Stevi Richie and Chloe Jasmine, dancer Flavia Cacace-Mistry and actor husband Jimi Mistry and champion gymnast Louis Smith and his former Towie star girlfriend Lucy Mecklenburgh prepare to take on the dreaded drop as they help two families win a star prize. This week see’s the Robinson family, daughter Reece, mum Michelle, dad Matthew and great aunt Shaz from Canterbury take on the Downie family son Gary, mum Michelle, dad Mark and Grandpa Gerry from Glasgow as they compete for prizes including a luxury family car, a high tech entertainment package including a top of range TV, a weekend break to Rome for the family or a year’s supply of tea & biscuits. Viewers will see the families attempt to recreate the jaw dropping talents of The Halves Project, a unique dance troupe form Ukraine whilst the Nana’s will be back to provide their hilarious take on modern phases and a cast of talented kids from performing arts group Stageworx from Stirling in Scotland will be putting on an impressive production of Oliver’s ‘Consider Yourself’. Keep it in the Family – the fun, frivolous and fantastically entertaining game show that brings high jinx and hilarity to Saturday nights. David Hall, Executive Producer ITV Studios said: “We’re beyond happy that ‘Keep It In The Family’ is returning for a second series on ITV. The mix of Bradley, our irrepressible Nanas, funny games, dressing people up in outrageous and hilarious costumes, and dropping the nation’s favourite celebrities was a winning combination, and we’re very much looking forward to doing it all again this year”. Keep It In The Family is an ITV Studios and Over The Top co-production for ITV. The series was commissioned by Elaine Bedell, Director of Entertainment and Comedy, ITV and Asif Zubairy, Commissioning Editor Entertainment, ITV. The executive producers are David Hall, ITV Studios and Nigel Hall, Over The Top Productions.